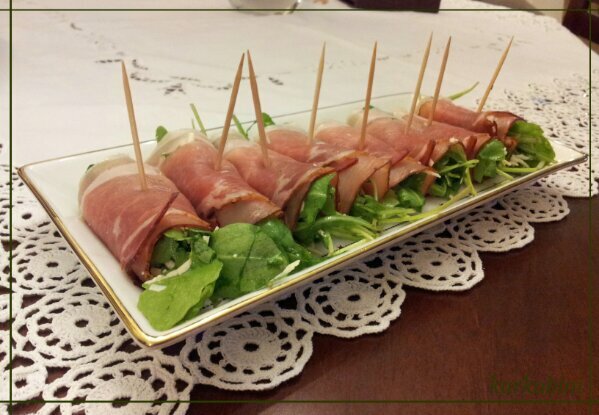 I love prosciutto and I consider myself lucky as it is also one of my aunt’s favourite ingredients for appetisers! What I also like is that she meets my daring side by being willing to experiment and try different taste combinations. This time she suggested with serve the prosciutto with rocket leaves. This appetiser is very simple to make, very delicious and it can be served with both beer and wine. Tip: It’s a bit salty so if you are not a fan of salty tastes I suggest you use a milder cheese or no cheese. In a bowl we mix the liquid ingredients with the mustard and we stir well. Add the cheese and keep stirring until we get a consistent mixture. We wash and add the rocket leaves. Take 2 tsp of our mixture and place it on one end of the prosciutto slice. We roll it and pin it with a toothpick. Indeed! Very easy to make as well! Can also work with cheese and other types of salad!